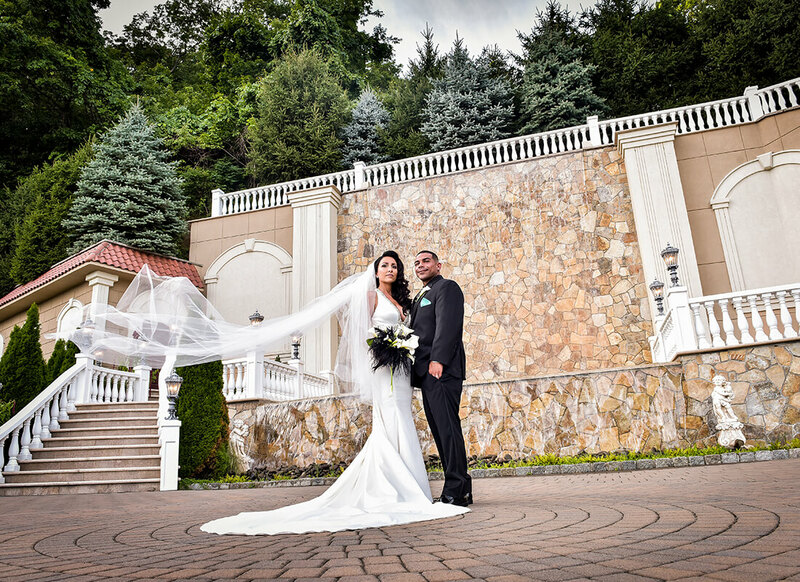 It was an upscale affair on September 2, 2016 at the Villa Barone in Mahopac, NY when Amanda and Rocco Bueti tied the knot. Such an elegant event called for an equally elegant gown and Amanda had chosen the perfect dress for the occasion. It was Amanda's birthday when she and her bridesmaids took a trip to the Pnina Tornai Boutique at Kleinfeld Bridal. Amanda was looking for a fitted gown with an open back; the rest of the details she kept an open mind about. Doing some online searching before she and her friends visited the boutique, Amanda had found a gown that she thought could be the one. When Amanda and her friends arrived at the famous bridal salon, she showed the picture she had of the gown to the consultant. The consultant went off and picked the gown along with a few others and brought them back to Amanda to try on. The first dress that Amanda stepped into was the gown she had brought in the picture of: a fitted sheath gown with a crystal embellished plunging neckline and open keyhole back. Believe it or not, for Amanda it was one gown and done! She had slipped into the gown and for Amanda that was it. Unfortunately for her bridesmaids that were expecting a long day of shopping, Amanda didn't want to try on any more dresses because the one she had on was “the one.” However, they did have a lovely surprise when Pnina Tornai herself came over to take Amanda's measurements for her dream dress! 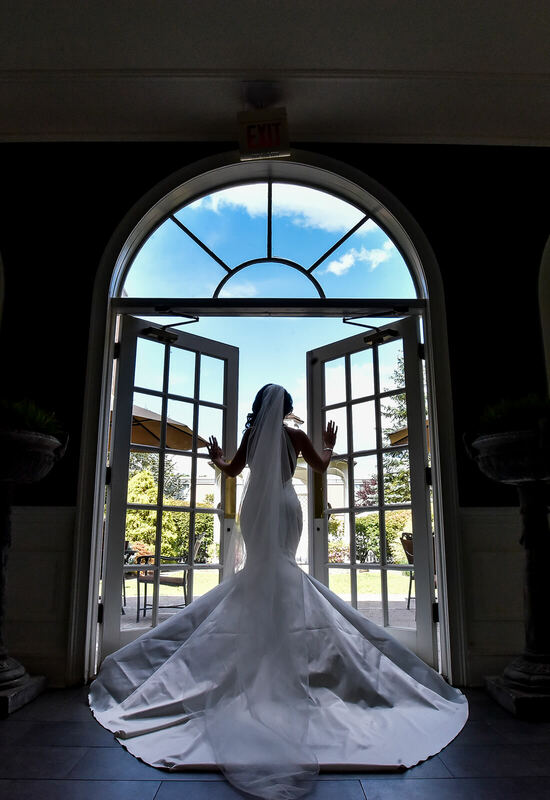 As an added bonus, upon finding out that it was Amanda's birthday, Pnina Tornai gifted her a lovely two-tier veil to go with her new stunning wedding gown. Talk about an amazing birthday gift! When Amanda's special day came around it was the second time that Amanda only needed to put on one gown. Her gown had just enough bling from the crystal embellishments around the neckline and the gown's long train added an extra “wow” factor to her look. “I felt stunning! It's almost indescribable how I felt in the gown,” Amanda explains of the overwhelming feeling of beauty that the gown gave her. 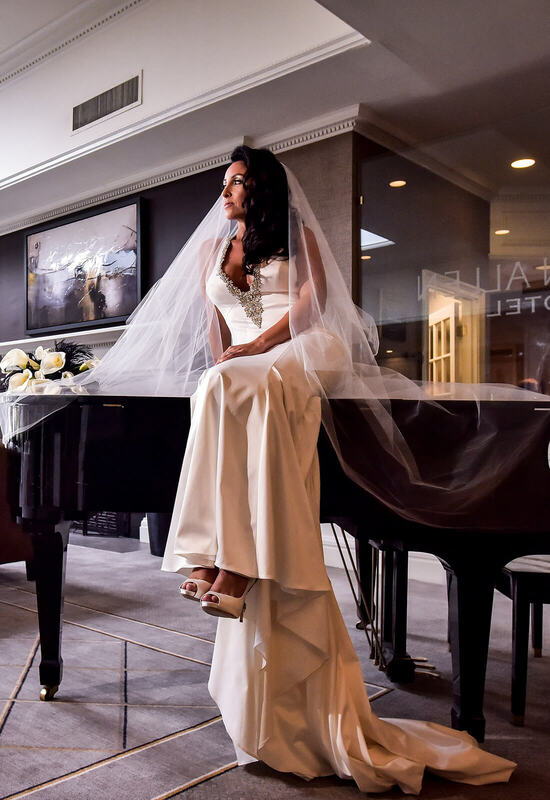 Feeling regal and beautiful in her alluring gown, Amanda wed her true love Rocco in fabulous style.